Directions: From Route 15: Just south of the bridge over the James River, turn east onto New Canton Road (Route 688) then left onto CG Woodson Road (Route 670). The Church is located just before the New Canton Post Office. We worship at 11:00 am on the fifth Sunday of those months with five Sundays. On the first and third Sundays we worship at Arvon Presbyterian Church, and on the second and fourth Sundays, we worship at Fork Union Presbyterian Church. 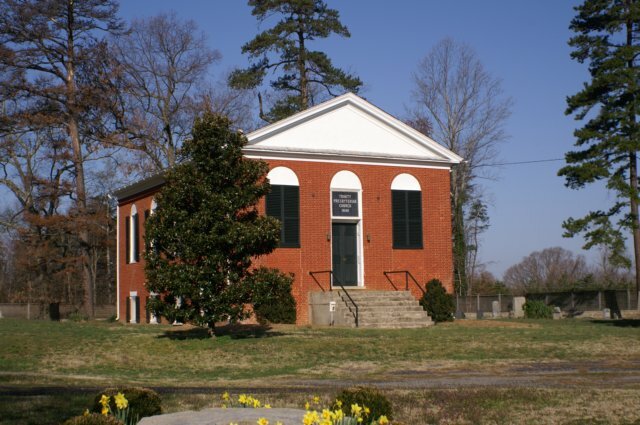 Trinity Presbyterian Church was organized August 11, 1827 as a Presbyterian congregation for New Canton and Cartersville, VA. In 1840 what was then known as "Upper Trinity Church" was built at the top of Main Street in New Canton Village. "Lower Trinity Church" was the congregation at Cartersville. In 1881, Trinity Church voted the "Welsh Chapel" to be founded at the slate mines in nearby Arvonia. On November 30, 1883, Upper Trinity Presbyterian Church separated from Lower Trinity Presbyterian. By September 26, 1885, the Welsh Chapel was organized from members of Trinity Church. This chapel is the present-day Arvon Presbyterian Church, a member of Christ Parish. Services are held at Trinity~New Canton Presbyterian Church on the fifth Sunday of those months with five Sundays. We also invite you to worship with us at Arvon Presbyterian Church on the first and third Sundays of the month and at the Fork Union Presbyterian Church on the second and fourth Sundays. During the spring of 2011 we completed some long needed renovations to our sanctuary. The interior was repainted, including the ceiling and the wonderful stenciling on the walls. We also completed some exterior work including repointing some of the brick, and fixing some problem guttering. We express our appreciation to Jerome Apperson and his group for doing the work! "According to the oral history of Trinity Presbyterian Church and this community, here are 45 Confederate and Union soldiers buried in mass graves directly behind this church. they left Appomattox after the surrender and headed for their homes north of here. Sick with disease, they died in a nearby camp. That they may not be forgotten, this plaque is placed by the Elliott Grays UDC Chapter #1877 2003"
The Clerk of the Trinity Session is Ms. Helen Fuqua. Ms. Margaret Ann Seay is the Treasurer and "Acting Clerk."